ShammingSituation: Book review of Investing Medical Devices - A Perspective From India by Dr Jagdish Chaturvedi. 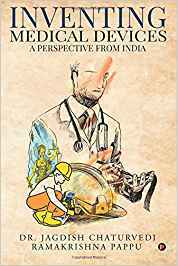 Book review of Investing Medical Devices - A Perspective From India by Dr Jagdish Chaturvedi. In this book, the authors share their experiences, anecdotes, insights, and failures while inventing and commercializing medical devices in India. The objective is to give entrepreneurs, designers, engineers, and clinicians a realistic expectation of the time, money, coordination and teamwork required to develop and launch a medical device in India. The book includes a special ‘How-I-Do-It’ section and detailed appendices that form a reference and resource handbook to guide budding entrepreneurs. This book also includes a new “Advice from the Experts” section, which shares the key advice to young innovators from 23 industry experts. The book is a recommended read for all healthcare professionals, entrepreneurs, and students who want to be successful in the medical device innovation space. In daily life, we come across a lot of people who are researching upon different medical inventions to help the mankind, and i have never ever come across such a wonderful book that talks about invention in such an easy and broad way. This book describes an entrepreneur’s entrepreneurial journey and this book is an asset for the entrepreneurs who are trying to enter the healthcare market and try something for their own. The author has brilliant described the process, his personal experiences and easy way to enter this market and to create a product on their own keeping the complexities and India’s environment in mind. What i really liked about this book is the easy going narration and i got to know something about a field and product which was totally new to me. The book is simple without any grammatical mistakes, simple cover and it goes well with the book. This book is a sort of self help book, so it might please the masses but it will surely appeal to the larger audience who are trying to break the shell and get out of their comfort zone and so something for the society.